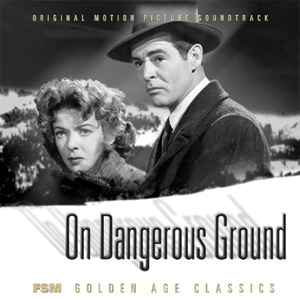 June 29, 2011, will be the day Bernard Herrmann would turn 100 if he were alive. The Soundtracks of the Week for this month will be his. 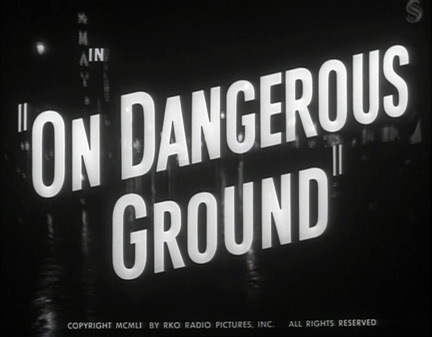 SotW #168 is On Dangerous Ground, a quintessential Herrmann score, one of his greatest and one which echoes in later Herrmann works. Many thanks to Film Score Monthly for putting this out. The original tapes were long gone, so FSM used acetate playback discs to make this CD. An Engineer's Note informs the listener that "Many hours of detailed restorative work have been performed, but these specific recordings exhibit a panoply of disc wear and injuries. … The listener must hear past the flaws". No problem. I notice some noise here and there but the power of the music overwhelms any deficiencies of the medium. The primary theme is "The Death Hunt", which must be on the same family tree as Herrmann's North by Northwest theme, though it's heavier and more intense, in sympathy with his music for Cape Fear and Torn Curtain. A "Prelude" first introduces this theme, and it's heard a few times throughout the score, notably in "Hunt Scherzo". "Solitude" is an interesting piece, played very quietly early in the movie for Robert Ryan in his lonely New York City apartment. On Dangerous Ground shares some DNA with Taxi Driver and it's interesting to note that Herrmann's "Solitude" is one of his only jazz cues, anticipating his music for Scorsese's film. The "Solitude" theme is subtly reprised in "Nocturne". "Violence" is a very short cue but with a handful of notes that stand out for being familiar. They turn out to be the tail of a memorable North by Northwest motif that was first written for On Dangerous Ground. The entire motif can be heard in the "Pastorale" cue. "Snowstorm/The Silence" reveals another familiar piece of music. 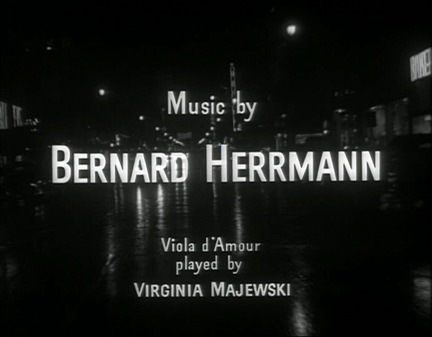 What would become Herrmann's theme music for the Have Gun — Will Travel series is actually the beginning of "Snowstorm". "Blindness" introduces the theme for Ida Lupino's character, the blind sister of the killer that Robert Ryan is chasing. This is one of many pieces to feature viola d'amore solos performed by Virginia Majewski. So important did Herrmann consider her contribution that he demanded she be given her own screen credit. When the studio executives said there was no room for her in the credits, Herrmann told them to put her with his credit. And so they did. Perhaps the titles of the remaining cues tell the story well enough by themselves. "Fright", "Faith", "The Searching Heart", "The Whispering", "Dawn/The Idiot/Fear/The Cabin". "The Death Hunt", "Hunt's End", "Grief", "The Winter Walk", "The Parting/The Return/The City/Finale". There's an alternate take of the "Prelude" and after that some amusing outtakes from the recording session. These give a rare and fascinating "fly on the wall" perspective and of course it's wonderful to hear Herrmann's New Yawk voice hectoring, apologizing, clarifying—and reminding the engineer that the viola d'amore must be prominent.